The National University of Ireland greatly welcomes the DES Consultation Paper and is pleased to respond. 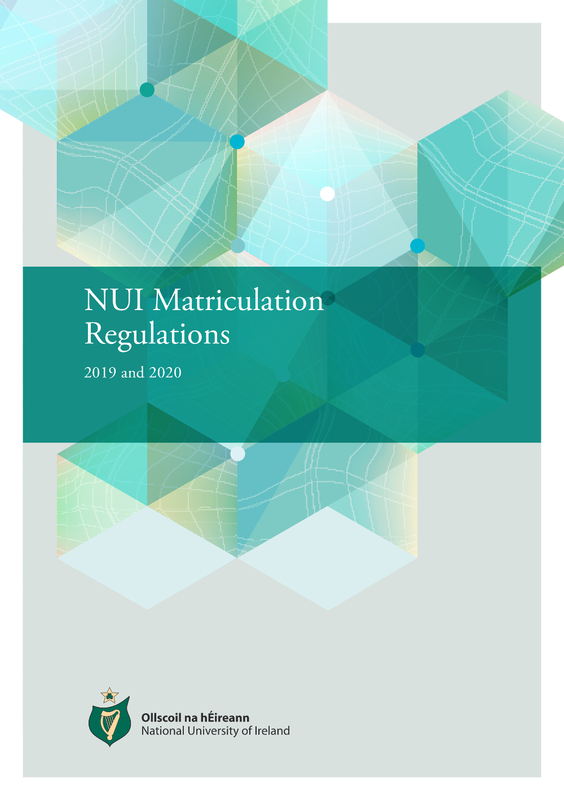 The DES circulars on the granting of exemptions are highly relevant to NUI as a university that requires Irish as a matriculation requirement. NUI grants exemptions from this requirement to all students who have received DES exemptions under these circulars but also receives applications for exemptions from students who for various reasons have not received such exemptions. NUI finds that the Department’s approach to the granting of exemptions from the study of Irish is fully consistent with the position of Irish in the Constitution and national policy in place since the foundation of the State that English and Irish are core subjects in primary and second-level education. NUI notes and supports the comments in the document on the advantages of bilingualism as part of the general educational experience of students and also in terms of learning other languages. In this context, the explicit linking in the Consultation Paper of policy in relation to the Irish language with the Languages Connect strategy is welcome. Overall NUI supports the thrust of the proposed draft DES circulars on exemption from the study of Irish and the aspirations towards greater clarity, simplicity and transparency in the processes involved. NUI agrees that in the light of greatly changed circumstances both in Irish society in general and in education, and also of deeper understanding of language learning, the revision of these circulars dating back to the 1990s is overdue. NUI welcomes the updating of the process for applying for exemptions and the criteria for the granting of exemptions. In particular, NUI welcomes the focus on educational needs rather than the use of diagnostic, categorical models in the granting of exemptions. The proposal to discontinue psychological assessments and cognitive ability scores as part of the exemption application process would also greatly simplify the process and the requirement that only one literacy attainment score should be at or below the 10th percentile to satisfy the criteria is also welcome. NUI notes the references in the Consultation Paper to university matriculation and specifically to the exemptions that it grants for matriculation purposes (p. 9 and p. 14) and is therefore pleased to clarify its policies in relation to the Irish language in terms of NUI matriculation and its approach to the granting of exemptions. Since its establishment in 1908, the National University of Ireland has required Irish as a subject for matriculation. The requirement was introduced following a strong campaign for the promotion of the Irish language as a marker of national identity in the new national university. The policy was controversial and divisive on its introduction and has been the subject of debate at various times since then both within and outside NUI. Under the Universities Act 1997, the NUI Senate remains responsible for determining the basic matriculation requirements for the constituent universities and has kept the policy under review in the light of changing circumstances. NUI policy on the granting of exemptions from Irish is influenced by the admission policies of the constituent universities and recognised colleges which in line with government policy promote expanded participation and access for underrepresented groups. The increasingly complex and heterogeneous environment for higher education today is characterised by heightened aspirations towards participation across the population, a student population which has experienced greater educational mobility than previous generations, greatly increased social and cultural diversity on campuses and a welcome increase in the proportion of students with disabilities seeking to enter higher education. In administering its policy on exemptions, NUI seeks to achieve fairness and in a situation of highly competitive university entry, not to confer any advantage on a student through the granting of an exemption. NUI’s policy on exemptions from Irish mirrors that of DES to a large extent. NUI grants exemptions to all students who have qualified for DES exemptions on the basis of the current circulars i.e. because of (i) education wholly or partly outside Ireland or (ii) a specific learning disability. In addition NUI grants exemptions to students born outside the Republic of Ireland. This provision has been in place since the introduction of the Irish requirement. 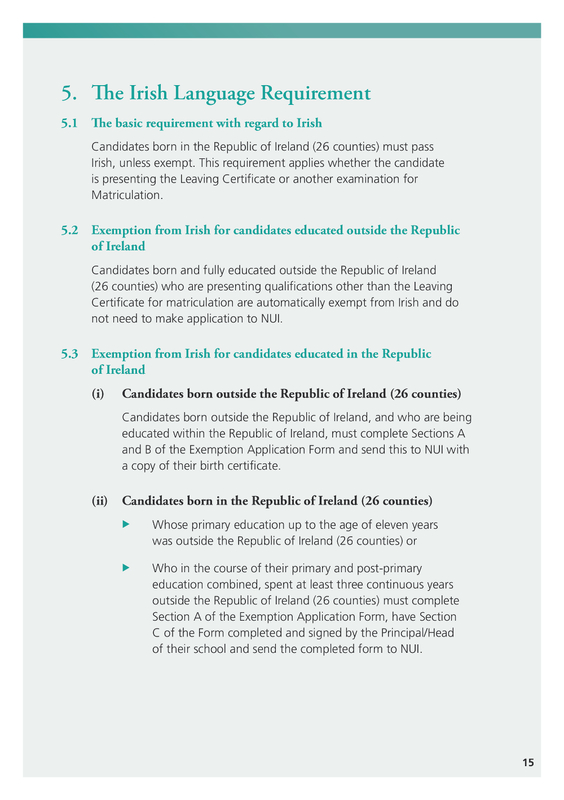 NUI suggests however, that a proportion of those granted NUI exemptions having been born outside Ireland would also qualify for DES exemptions on the basis of education outside Ireland, the application process in the former case being simpler than in the latter (a shorter form and copy of birth certificate compared with a longer form signed by the school Principal). As well as granting exemptions to students who have qualified for exemptions from DES, NUI must also make provision for students not qualifying under the DES circulars, including those who attend second-level schools not recognised by DES or who are home-schooled. 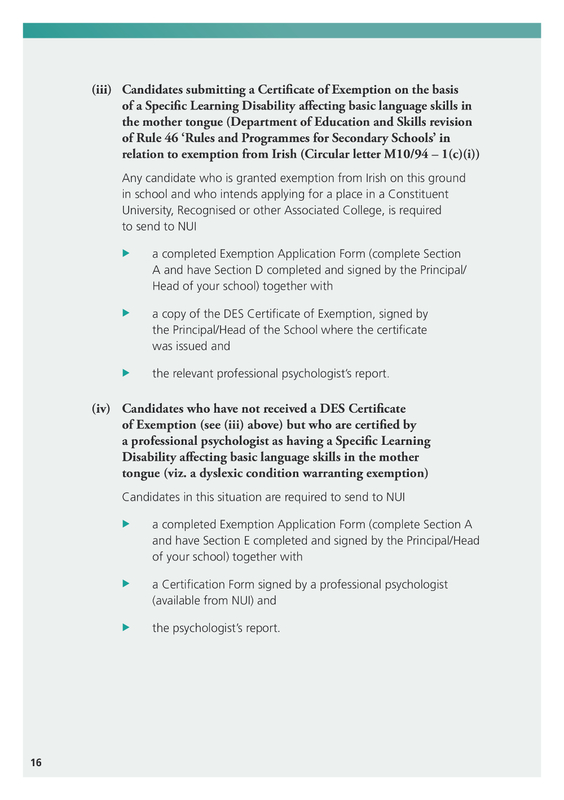 NUI accepts applications for exemption based on a specific learning disability certified by a professional psychologist. 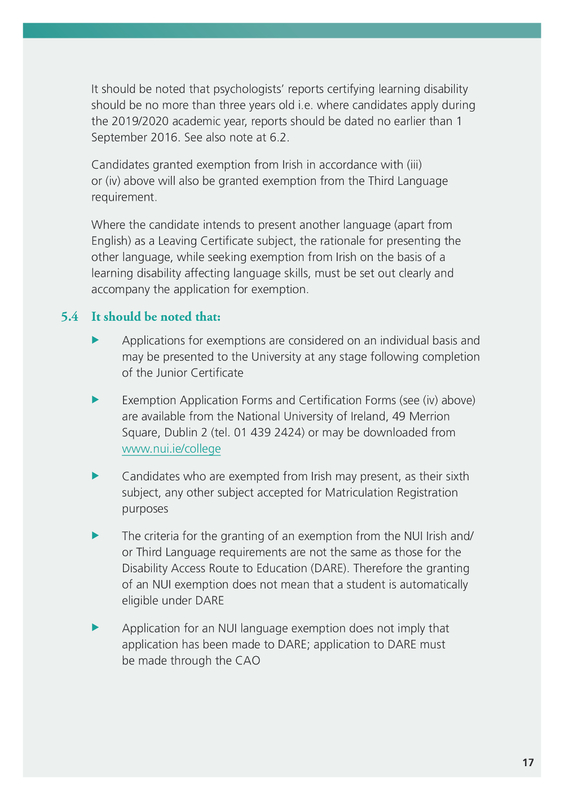 In considering such applications, NUI has been influenced by the DES criteria, but in the light of the consequences for a student who fails to secure an exemption, has interpreted these slightly more liberally and has granted exemptions annually to small numbers of students on the margins of qualifying under the DES criteria. NUI therefore particularly welcomes the expansion of the definition of dyslexia in the draft revised circular and the proposal that only one literacy attainment score should be at or below the 10th percentile to satisfy the DES criteria. In our view this should lead to a reduction in the numbers applying for exemptions from NUI who have not already been granted a DES exemption. NUI also considers applications for exemptions from students in other exceptional circumstances. In particular, students who present medical evidence that because of physical or mental illness they have been absent from education for significant periods are looked on sympathetically by NUI. While it can be argued that the impact of such absences is as great on other subjects as on Irish, because of the centrality of Irish to NUI matriculation and the severe consequences of not securing an exemption, NUI tends to accept such evidence as grounds for granting an exemption from Irish. Similarly, NUI grants exemptions from Irish to students presenting evidence of serious physical or sensory disabilities. NUI’s experience supports the Inspectorate’s research mentioned in the Consultation Paper that applications for exemptions at post-primary level are ‘strongly linked to participation in the state examinations and related to issues concerning matriculation into universities’. While NUI considers applications from students at any stage following Junior Certificate, the majority of applications are received from students in their Leaving Certificate year, with peaks being experienced around 1st February, the deadline for CAO applications and around examination time. NUI notes that the comments (p.10) from principals in post-primary schools in relation to the issues posed for schools by NUI’s arrangements for granting exemptions and the comment that ‘the NUI criteria are not entirely consistent with the Department Circulars’. NUI has set out above the policy of the university on the granting of exemptions and the context in which exemptions are granted and has drawn attention to the severe consequences for students failing to secure exemption. Any attempt by NUI to adopt a more restrictive approach to the Irish requirement would be counterproductive and would be likely to lead to increased pressure to remove the requirement altogether. NUI does not wish in any way to create difficulties for schools. We emphasise that the granting of exemptions relates strictly to admission to the University and should not be used to interfere in the relationship between schools and their students. The table below gives details of language exemptions granted by NUI in the period 2015 – 2018, based on applications received by NUI. It does not include details of exemptions recorded by CAO in respect of applicants presenting qualifications other than the Leaving Certificate and with addresses outside the Republic of Ireland. Such applicants are recorded by NUI automatically as being exempt from Irish. SLD is a specific learning difficulty relating to language acquisition (dyslexia). Prof Psych Cert is certification from a professional psychologist. Many of those granted exemptions by NUI having been born outside Ireland would also qualify for a DES exemption on the basis of education outside Ireland. They find it more convenient to send copies of their birth certificates to NUI than to complete the lengthier process required for the latter exemption. The data reflects an increase of 8% in exemptions granted by NUI between 2015 and 2018. Not surprisingly, given that not all students taking the Leaving Certificate apply to NUI institutions for admission, the numbers applying to NUI for exemptions from Irish are considerably lower than the numbers exempted by the Department. The Consultation Paper indicates that in 2016, 8496 did not take Irish in the Leaving Certificate, noting that this is higher than the number of students granted exemptions by the Department and suggesting that it may include ‘candidates who may have secured a National University of Ireland exemption’. The NUI data above shows that in 2016, the numbers receiving NUI exemptions (2,703) are equivalent to only 32% of those who did not sit Irish in the Leaving Certificate. As the Consultation Paper notes clearly there are other reasons for the numbers not taking Irish in the Leaving Certificate which would merit further study. It is NUI’s experience that a proportion of students and parents do not see the value of studying Irish, and consider that their chances of securing points would be improved if they were not required to study the language. NUI suggests that it would be helpful if the Department, drawing on the research to which is has access, and in the context of the Languages Connect strategy could continue to promote the advantages of bilingualism, particularly in terms of acquiring other languages at a time when the importance of language proficiency is increasingly appreciated. 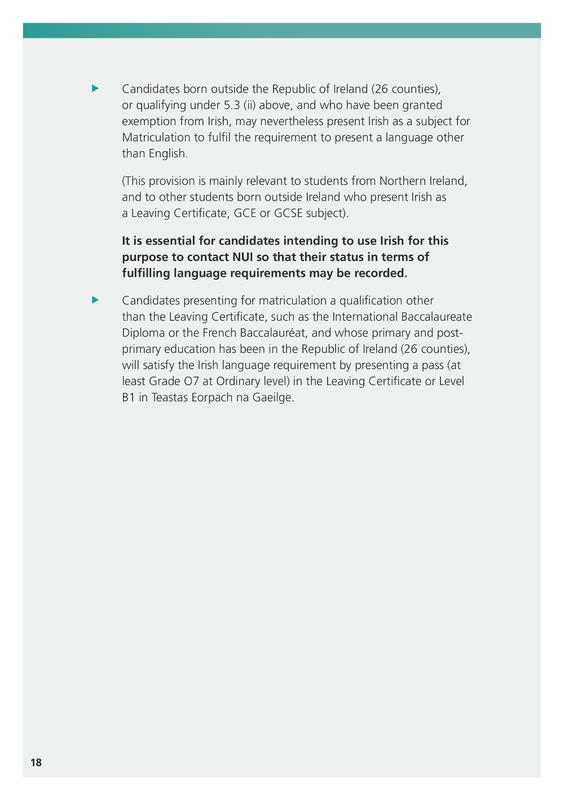 NUI seeks to encourage the study of Irish by students who are eligible for exemptions by allowing them to present Irish as a language where there is a language requirement for the programme of their choice (i.e. to fulfil the NUI Third Language requirement). It may be noted that in the period 2015 – 2018 almost 300 students availed of this provision. The NUI Irish Language requirement for matriculation, as set out in NUI Matriculation Regulations, is appended. While the comments relate to NUI and while they range far more broadly than the scope of the DES circulars currently being revised, NUI suggests that the approach to the Irish language in schools adopted by the Department, as reflected in these circulars, has the potential to exert a profound influence on public opinion in relation to the Irish language and that care should be taken that the influence is positive rather than negative. NUI is therefore pleased to welcome the proposals in the draft circulars designed to clarify and simplify procedures. NUI appreciates the challenges facing the Department and the schools sector in implementing public policy on the Irish language in a greatly changed, diverse and multicultural society.